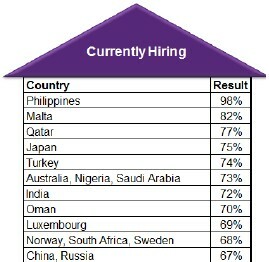 Emerging markets have driven a general increase in hiring despite the euro crisis. A recent issue of The Economist had a picture of a blazing euro-shaped comet on the cover, with big block text asking: IS IT THE END? But when it comes to global hiring, things aren’t quite so grim. Antal International’s most recent Global Snapshot Survey actually found hiring levels above where they were this summer. Overall, 55% of organizations worldwide were hiring in the third quarter, up from 52% in July. This would seem to bode well for anyone wanting work abroad. India also showed strong hiring numbers. 72% of Indian firms are hiring, and 75% plan on hiring more staff next year. Global Snapshot continues to highlight just how dramatic the shift of economic power is becoming. If this trend continues it could be that the next generation of movers and shakers in the business world will be found in Beijing, Brasilia or Bangalore rather than in Boston, Birmingham or Berlin. But it would be a mistake to simply hop a plane for Asia. As we’ve written before, job growth in emerging markets is occurring alongside a decline in “traditional” expat assignments. Many companies in countries like Singapore are hiring more locals than ever before. They are usually much cheaper and just as qualified as expat labor. Hence, the number of “escape routes” may be dwindling just as fast as European jobs.